HRD Canada is delighted to announce the winners of our fifth annual Canadian HR Awards, celebrated at our Oscars-style event last week. 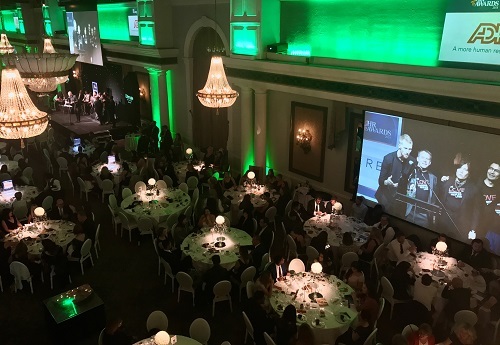 HR leaders from across the nation gathered to celebrate the best and brightest in the sector at Toronto’s Liberty Grand, with the top performers in each category taking home the much-coveted prizes. Sponsored by Ultimate Software, the awards included The ADP Canada Award for HR Rising Star of the Year, The Xref Award for the Most Innovative Use of HR Technology and The KPMG in Canada Award for HR Leader of the Year. It was a night of unbridled celebration, hosted by Jessi Cruickshank - “the funniest woman on TV today, period”. Winners included Alexis Corbett, of Bank of Canada, who snagged HR Leader of the Year - and Heidi Hauver, of Keynote Group, who took home the prestigious Leadership Agency Award for Woman Of Distinction.